Fill out our simple form and get quotes from local Harpists. Harpists are a sophisticated and elegant addition to any event and in particular are a popular choice for weddings. Hiring a harpist for your wedding helps bring a certain class and serenity to your big day, as their melodic tunes in the background relax your guests as they chat away. There are three main types of harpist hire available - concert, Celtic and electric - and each play their own distinct type of music. 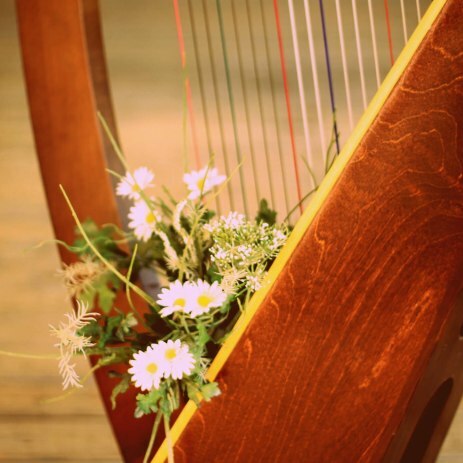 Be sure to discuss with your harpist the type of music you’d like or the atmosphere you’re looking to create and they can recommend the best type of harp for your wedding or event. It’s also worth considering where your harpist will set up in your venue as many will require approximately 2 square metres of space. To find out more and to hear from harpists available to hire in your local area, simply complete a request form. I'm an Irish Lever Harpist with both a small and full size Celtic Harp. I have years of experience performing, and am able to take on the spot requests. Award-winning entertainment. Musicians, DJs and live bands for hire. Weddings, parties and events across the UK. Tailored packages and hand-picked performers - reserve your date today! Harpists have been entertaining guests for almost 5000 years, so why not bring a traditional piece of history to your wedding or event? Harpists can produce almost otherworldly sounds that enhance any room and they are the perfect musical accompaniment if you’re planning a fantasy or fairytale themed event. Harpist hire is also available for outdoor events, although in most cases you’ll need to provide a rain cover for the harpist in case the weather turns suddenly. A dry surface is also required to avoid any damage to the harp. A standard harpist set would be approximately one hour, but again, it’s best to discuss this in advance with your supplier. To learn more about hiring a harpist for your event and to hear from the best local suppliers, simply complete a request form now.